Prepared by the Atmospheric Water Management Standards Committee of the Standards Development Council of the Environmental and Water Resources Institute of the American Society of Civil Engineers. Standard Practice for the Design, Conduct, and Evaluation of Operational Precipitation Enhancement Projects describes the application of cloud seeding technologies to facilitate the conversion of atmospheric water vapor into precipitation. By using a variety of meteorological and hydrological observations, water resources engineers can design, implement, and evaluate the effectiveness of precipitation enhancement methods. Standard ANSI/ASCE/EWRI 42-17 provides an introduction to the history and technology of cloud seeding and describes the scientific basis for examining the efficiency of both natural precipitation and human-induced weather modifications. 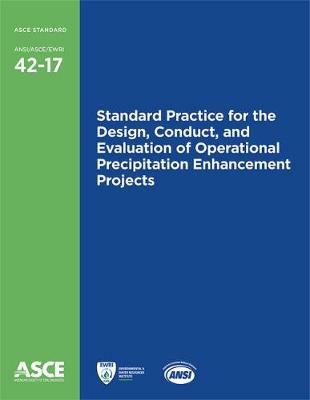 This standard covers design aspects of precipitation enhancement projects, including project scope, seeding agents, targeting and delivery methods, meteorological data, deployment of equipment, legal issues, and environmental concerns. Operational issues such as manuals, personnel requirements, decision-making hierarchy, communications, safety, and public relations, are considered. Finally, the components of project evaluation, including project design constraints, evaluation measures, and dissemination of results, are surveyed. This standard updates the previous version, ASCE/EWRI 42-04, to reflect the latest science, engineering, and technological advancements since 2005. All sections have been streamlined and revised to better align with project operations. The standard has been reorganized to present mandatory provisions and nonmandatory commentary. The coverage of warm cloud seeding has been improved throughout. The discussion of project scope emphasizes the importance of defining it as completely and realistically as possible. Engineers and government regulators involved in water resources management and weather modification will turn to this standard for the most current guidance on cloud seeding technologies, thus saving time, money, and more.